I responded to an ad on Shoppin' Broadway from a collector who has been seeing shows since the 1950s. 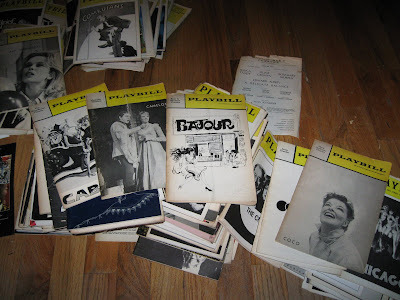 He is moving away from Manhattan and just wanted his Playbills to go to a good home, so today I picked up a huge pile of show playbills with titles ranging from letters A-D and from years in the early 1960s through 2008. I'm in Playbill Collecting Heaven.